Enid: "Will I see him tonight?" Galen: "What IS that clump of white crap on the floor?" K.A. : "The first step in my plan to take over the world has been achieved. Nanny has taken the children to the zoo for the day. Now for some cold salmon and a coup!" Karen: "How am I going to get them to do what I want?" Marvin: "Damn, it's hot ... wish I had a cold adult beverage in my other hand!" Elle: "Whew! I'm done doing my blog rounds for the day..."
First, your new blog look is way cool. Not being ingratiating or disingenuous, it really is better than the old one. Like if very much. Now, the caption: "What IS that clump of white crap on the floor?" The new look ROCKS! Gorgeous -- and it's a better indicator of content, too. Caption: "The first step in my plan to take over the world has been achieved. Nanny has taken the children to the zoo for the day. Now for some cold salmon and a coup!" The new look is fab, Enid. Hmm, as to what she's thinking, "how am I going to get them to do what I want?" "Damn, it's hot ... wish I had a cold adult beverage in my other hand!" Thanks Galen, KA, Karen and Marvin, you guys sure know how to do a caption! I'll will post them up the main body as a tag-a-long, hope you don't mind. Others, come and join in. Wow! The new blog looks great!! Caption: "Whew! I'm done doing my blog rounds for the day..."
So sensual and inviting--love your new blog look. Cool yet hot! "Suddenly I'm feeling all spinny - did someone slip a roofie into my saki?" 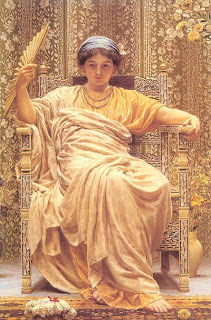 Re: the new look,I love the colors, the overall style, and the beautiful golden lady painting. Less sure about the lips, but hey, I'm not big on writing erotica, when it comes right down to it. They certainly get your message across!